The February issue of the Bible Places Newsletter has been released. If you do not receive the Newsletter, I suggest you check it now (here). When you reach the bottom of the page you will see a link that allows you to subscribe. The current issue of the Newsletter features photo from the Early 20th-Century History, the seventh volume in The American Colony and Eric Matson Collection. You will be able to download a PowerPoint presentation featuring these historic photos. The entire album of more than 400 historic photos is available at the discounted price of $15. The entire 8-volume collection is on sale for $99. This is a great and important collection. Read about it at Life in the Holy Land. Palestine was under the control of the Turkish Ottoman Empire from 1517 to 1917. The photo below shows General Allenby and the British troops entering Jerusalem through the Jaffa Gate, Dec. 11, 1917. General Allenby enters Jerusalem through Jaffa Gate - 1917. Newsweek, March 1, 2010, has an article here about a temple complex in Turkey that is said to predate the pyramids. Göbekli tepe in southeastern Turkey. The site is southeast of Sanliurfa, the Moslem traditional birthplace of Abraham. It is east of Haran, the home of Abraham according to Genesis 12:4, and north of the Syrian border. German archaeologist Prof. Klaus Schmidt is directing the dig at the site said to have a temple built 11,500 years ago — 7,000 years before the pyramids. The importance of this find for Biblical thinking is this— the Bible says that from the outset, human beings were created in God’s image. Human beings were religious creatures from Day One. Archaeologists and sociologists have long dismissed this theory saying organized religion comes much later in the game than the beginning of civilization and city building. As Ian Holder director of Stanford’s prestigious archaeology program says— this is a game changer. Indeed, it changes everything experts in the Neolithic era have been thinking. Schmidt is saying that religion is the cause of civilization, not the result of it. Towns were built to be near the Temple complex. Agriculture was undertaken to feed those living there and supply the temple complex, and so on. The first instincts of humans were to put religion first. Maybe there is more to that Genesis story than some have been willing to think or admit. Maybe human beings are inherently homo religiosis. This short video features Prof. Schmidt at Göbekli tepe. Tuesday we took our 5-year-old grandson to the Manatee Viewing Center on Tampa Bay (Gulf of Mexico). Our local electric power company (TECO) has provided excellent walkways that allow visitors to see the Manatees who come during the winter months to enjoy the warm water discharged from the power plant. 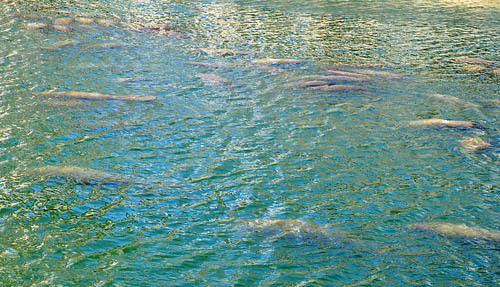 Manatees at the TECO Manatee Viewing Center. Photo by Ferrell Jenkins. Our grandson enjoyed the visit, especially when he saw a large number of the Manatees moving about in the water. Well, he enjoyed turning $1.53 into three smashed pennies, too. In the learning center there are several exhibits of interest both to children and adults. 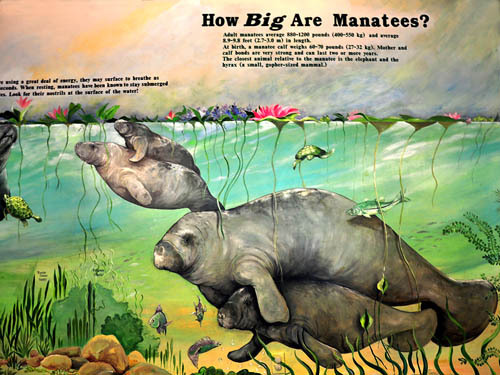 How Big Are Manatees? Photo by Ferrell Jenkins. You may have wondered how I could relate this visit to traveling in the Bible lands. Well, here it is. rock badgers (NET; ESV; NKJ). The NET notes say this is the Syrian Hydrax. 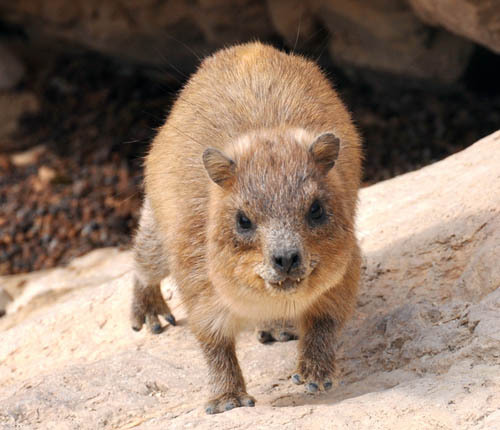 Fauna and Flora of the Bible identifies this animal as the Syrian Coney (Procavia syriacus). The rock badger lives among rocks from the Dead Sea valley to Mt. Hermon. One of the best places to see the rock badgers is at En Gedi on the west shore of the Dead Sea. Rock Badger at EnGedi. Photo by Ferrell Jenkins. In the past few days we have called attention to the excavations being conducted by the Israel Antiquities Authority at Jaffa Gate in Jerusalem. 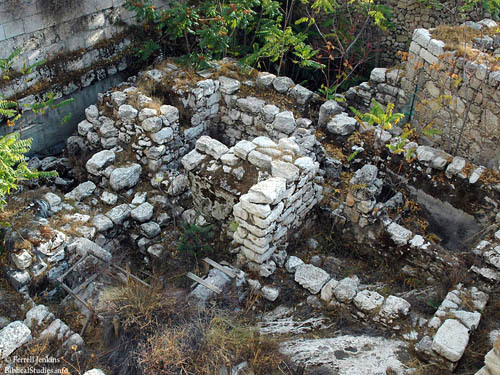 Archaeologists working in the area announced the discovery of an East-West road of the 4th century Byzantine city and the high-level aqueduct that brought water into the city in the second and third century. 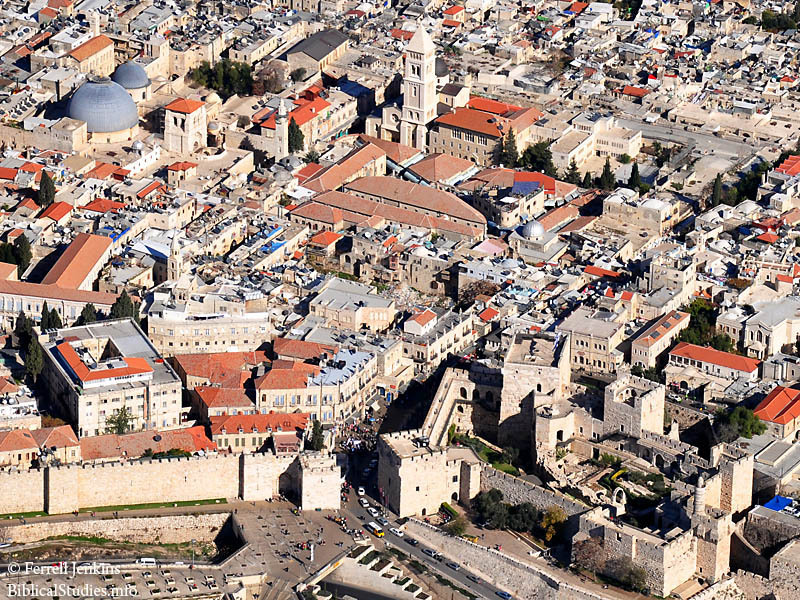 The photo below shows Jaffa Gate and the Citadel from the air. 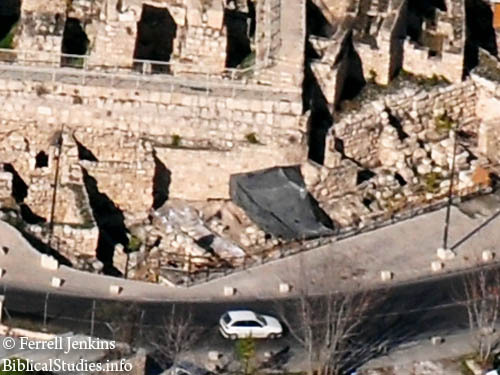 Hezekiah’s Pool is visible just to the left (north) of the main street (David Street), almost in the center of the photo. The dome of the Church of the Holy Sepulchre is visible on the upper left side of the photo. 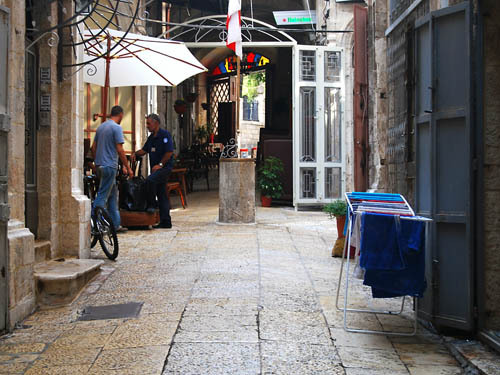 Most of the area shown in this photo is called the Christian Quarter of the Old City of Jerusalem. 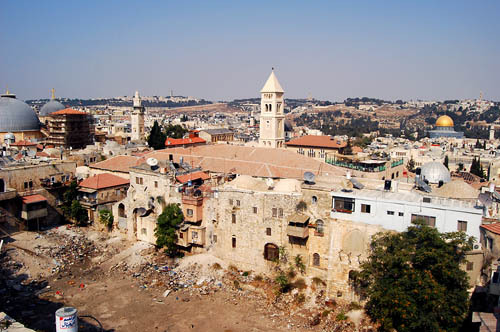 Aerial view of the Christian Quarter of the Old City. Photo by Ferrell Jenkins. Rome gained control over the western Mediterranean in 146 B.C. By 131 B.C. Rome controlled the previous territory of Attalus, king of Pergamum. By 64 B.C., the Roman general Pompey ended the Seleucid dominion in Syria and the territory was annexed as another Roman province. Judea became a part of the Roman province of Syria. The Romans occupied the land they would name Palestine until the 4th century A.D.
Roman Legions Post near Jaffa Gate. Photo by Ferrell Jenkins. 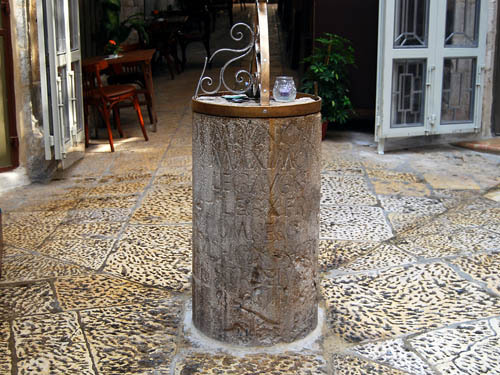 Roman Post of Tenth Legion in Jerusalem. Photo by Ferrell Jenkins. The Israel Antiquities Authority announced earlier today the discover of the High-Level Aqueduct that brought water into Hezekiah’s Pool in the Roman city of Jerusalem. A beautiful aqueduct, standing 1.50 meters [4.92 feet] high and built of large stones, has been situated for almost two millennia right under one of the most familiar and traveled places in Jerusalem – beneath the road that leads from Jaffa Gate toward the David Citadel Museum and the shops on David Street. According to Dr. Ofer Sion, excavation director on behalf of the Israel Antiquities Authority, “The side of the aqueduct was discovered during the course of the excavation. When we removed the stones in its side and peeked into it we saw a splendidly built aqueduct covered with stone slabs where one can walk crouched down for a distance of approximately 40 meters. It is very exciting to think that no one has set foot there for many hundreds of years”. According to Sion, “The noted Land of Israel scholar, Dr. Conrad Schick, described a specific section of the aqueduct in a survey he conducted at the end of the nineteenth century. In 1898 a building was erected in this area which afterward became what we know of today as the Imperial Hotel. Schick’s documentation provided us with the clue that led to exposing this section of the aqueduct”. The aqueduct is c. 60 centimeters [23.64 inches] wide and 1.5 meters [4.92 feet] high. 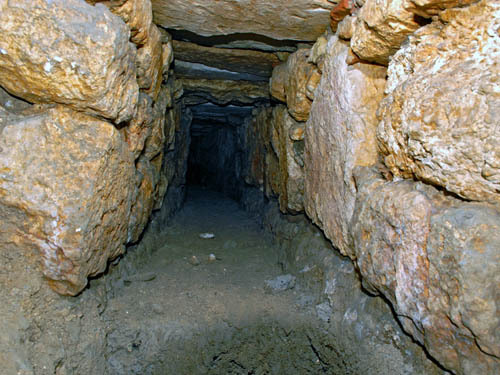 Shafts were exposed at fifteen meter intervals or so that allowed the ancients to check the state of the aqueduct from what was the surface level in those days. Second century high-level aqueduct in Jerusalem. Photo: Assaf Peretz, IAA. A short video from ITN features Dr. Ofer Sion and the upper aqueduct here. Todd Bolen calls attention to Tom Powers — View From Jerusalem in which he includes the late 19th century plans by Conrad Schick. Tom has some great photos made during the excavation. For centuries, the water for Jerusalem came from the Gihon Spring on the east side of the city. From the time of Herod the Great, at least, water for the city was brought from Solomon’s Pools south of Bethlehem by aqueduct. This was a distance of about 8 miles. The High-Level Aqueduct conveyed water to the high part of the city where King Herod’s palace and Hezekiah’s Pool were situated, the latter being the main source of water for all those arriving in the city; and the Low-Level Aqueduct carried water to the Temple Mount and the Temple. So many names in the Holy Land have nothing to do with the person for whom they are named. The Citadel of David is not. Solomon’s Pools are not. Hezekiah’s Pool may not be. These names were attached to various structures by later pilgrims. Jerome Murphy-O’Connor describes Hezekiah’s Pool. This great reservoir is entirely surrounded by buildings, and is accessible through the Coptic Khan…. At present the dry pool is used as a rubbish dump by the dwellings which surround it on all sides, but a much needed restoration project is on the drawing board. Murphy-O’Connor says the pool “is thought to date from the Herodian period when it was fed by an aqueduct (visible outside Jaffa Gate) coming from Mamilla Pool.” He says Josephus mentions the pool under the name Amygdalon (Almond Tree) (War 5:468). He says this name, Amygdalon, is probably a deformation o f the Hebrew migdal (tower). The reference is to the towers of Herod’s palace. I have been upstairs, or on the roof, of the Petra Hotel several times to photograph Hezekiah’s Pool. The photo below was made in early September, 2008. The area was the cleanest I had seen it. The Petra Hotel is immediately east of the Imperial Hotel mentioned in Tom Powers blog. The view from the hotel roof is good. To the left is the dome of the Holy Sepulchre. The Lutheran Church tower is in the middle of the photo. The Dome of the Rock is visible to the right. In the distant left is Mount Scopus. To the right is the Mount of Olives. Hezekiah's Pool from roof of the Petra Hotel. Photo by Ferrell Jenkins. The full news release by the IAA may be read here. HT: Todd Bolen, Bible Places Blog; Joseph I. Lauer.